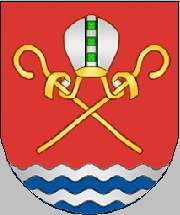 Esposende commune probably has no proper symbols but shares those of Esposende Municipality, this webpage displays a plain white shield with mural crown with four visible towers (town rank). Esposende Commune was one of the pre-2013 communes of Esposende Municipality (q.v. ); it had 3595 inhabitants in 2011 and covered 1.7 km². Shield Or with base wavy of Azure and Argent, scales Vert balanced by a flamy sword Gules hilted Sable, flanked by a watermill's wheel Azure at dexter and a salt pyramid Argent at sinister. Mural crown Argent with three visible towers (village rank) and white scroll with inscription in black initials "MARINHAS - ESPOSENDE". Marinhas Commune was one of the pre-2013 communes of Esposende Municipality (q.v. ); it had 6193 inhabitants in 2011 and covered 10.4 km². Shield Gules with base wavy of Argent and Azure, in chief a mitre Argent gemmed Vert adorned Or, beneath two croziers Or in saltire. Mural crown Argent with three visible towers (village rank) and white scroll with inscription in black initials "GANDRA - ESPOSENDE". Gandra Commune was one of the pre-2013 communes of Esposende Municipality (q.v. ); it had 1323 inhabitants in 2011 and covered 5.2 km².